ZenuLife is experts in manufacturing high standards of premium health and beauty products. In fact, it can help people improve their system, bowel and stomach problems. It works to enhance personal health and lifestyle using nature’s provision. 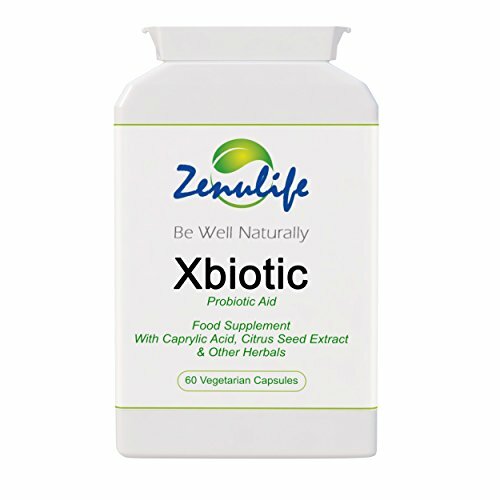 This Xbiotic is a powerful formula containing a mix of 15 key ingredients. It is helpful in combating the root of candida and its symptoms. Thus, it is worth in scraping off the coated tongue and bad breath. Treats oral and reproductive system infections. Relieves anxiety, depression and mood swings. Cures skin redness, sores, and nail deterioration. Works for dryness and itching troubles. Eyes, ears, nose and sinus issues. Also good for digestive system, bowel and stomach problems. Xbiotic Anti Candida 60 Capsules Cure are powerful formula containing a mix of 15 key ingredients. It is helpful in combating the root of candida and its symptoms. Thus, it is worth in scraping off the coated tongue and bad breath. It treats oral and reproductive system infections. Calcium Caprylate: This Calcium Caprylate possesses anti-fungal and antibacterial properties. It is one of the essential remedies against the organisms of Candida Albicans. Aloe Vera: There are numerous benefits of this magical herb. It is can protect and soothe the digestive system. Equally, helps in the elimination of the toxic minerals from the body. Neutralizes free radicals created by the toxic elements. Garlic powder: Garlic powder is a beneficial remedy for general health troubles, gangrene, infections and high blood pressure. Besides, it is antibiotic, antiviral, antibiotic, antiparasitic, antispasmodic and fungicide in nature. Beet Root Fibre: This fiber is enriched with iron and salicylic acids. It assists in the regeneration of the red blood cell and helps the liver to break down the stored fats. Thyme: Thyme is good for coughs, infections, mouth ulcers, irritable bowels and candida. Rosemary Leaf Extract: Rosemary is well known as one of the ‘super antioxidant herbs’. It works against intestinal troubles and has a broad range of anti-microbial effects. In fact, this rosemary leaf is an effective component to help fight candida. Lactobacillus acidophilus and Bifidobacteria: Helps in protecting the body against microorganisms related to food poisoning and other infections like thrush and candida. Oregano: This element includes numerous constituents which inhibit the growth of Candida. Cinnamon Bark: This bark is capable of suppressing the growth of numerous micro-organisms like E.coli, Staphylococcus aureus, and Candida albicans. Zinc Nitrate: This is an important element needed for a range of body functions. Mainly, like the formation of anti-oxidant enzymes and in the stimulation of a healthy immune system. Besides, also helps in the body detox processes. Cloves: Cloves act a carminative, mild anti-spasmodic and a powerful anti-neuralgic warming stimulant. Quercetin: This is beneficial for the nervous system, hair circulatory system, skin, adrenal glands, carbohydrate metabolism and in strengthening your bodies immune system. Glucosamine (NAD): This is an important nutrient involved in repairing the internal tissues, joint health, strengthening the bones and helps increase the recovery time. Citriciadal – grapefruit seed extract: Maintains the digestive and the immune system from the harmful infections. It includes highly potent phytochemicals and also possesses certain anti-parasitic and antibacterial characteristics. Alternatively, also helps the body keep a natural balance. You may take a higher dose of 1 capsule 3 times per day for up to 3 weeks. Similarly, if the die off of the Candida is too severe. Then, you may lower the dosage to 1-2 capsules per day (until the symptoms completely disappear. Almost all the ingredients included in this formula are obtained through natural resources. Thus, there are no known side-effects yet reported from the users. Overall the product has received 3.6 stars out of 5 stars. This is a soothing formula for thrush, yeast, bacterial and fungal infections. It is a blend of environment-friendly bacteria like (pro-biotics) Acidophilus and Bifidophilus. Thus, making an ideal choice for individuals who wish to maintain a healthy gut environment. Besides, most of the customers have reported that it has yielded good results than the tongue scraper thrush. The mix is also effective against other digestive troubles including bloated stomach, Celiac disease, ulcerated colitis, and constipation. Here are some honest reviews for your reference. Let’s have a look at them. This may help you in making a right choice towards this solution. Where to buy this Xbiotic Anti Candida 60 Capsules Cure Thrush, Yeast, Fungal and Bacterial infections? The Tongue scraper thrush is available for sale online at zenulife.com and at amazon. They are available at a much cheaper rate with certain discount, coupon and promo offers. Zenulife offers 10% off on purchase of 2 Xbiotic Anti Candida 60 Capsules Cure Thrush, Yeast, Fungal and Bacterial infections, 10% off on orders over $100, free worldwide shipping on the orders over $100. Further, you may also sign up with your email address for receiving the upcoming deals and offers. In conclusion, oral thrush is a fungal infection that will not leave that easily. It needs a serious treatment. So, try this Xbiotic Anti Candida 60 Capsules Cure Thrush and get rid of the oral thrush.